Cubic may combine London’s contactless approach with Chicago’s Ventra card to bring a new fare payment system to NYC. As the MTA finally for real this time gears up to replace the Metrocard, the global politics behind contactless fare payment technologies took an interesting and intriguing turn a few weeks ago as Transport for London announced a licensing arrangement with Cubic. In an arrangement that will allow London to monetize its contactless fare payment system and permit Cubic to bring a ready-for-market system to its customers around the world, TfL will license its current contactless fare payment system to Cubic. The deal was announced the week the responses to the MTA’s new fare payment system RFP were due, and although we won’t know the results of that RFP for a few months, the Cubic/TfL deal certainly made it seem as though New York is heading for a system similar to London’s current contactless system. “Contactless payments have completely transformed the way people pay for travel in London and this deal will allow other world cities to benefit from the hard work we put into making the system work for our customers,” TfL’s CTO Shashi Verma said. This deal allows Cubic to bring London’s best-in-class contactless fare payment system to the rest of the world. London adopted the technology for buses in 2012 and Tube and rail services in 2014 (which gives you an indication just how far behind the MTA is in the fare payment game). In the intervening years, TfL and Cubic have recorded over 500 million journeys off of 12 million unique debit and credit cards from 90 different countries and mobile devices. Gone is the need for a costly proprietary fare payment system (such as, say, a Metrocard). In terms of performance improvement, an open system obviates the need to maintain a proprietary fare payment system. While a transit agency can still issue its own fare cards for those who don’t have bank cards or don’t want to tie a credit or debit card into a transit agency payment system, the option exists, but at a much lower cost to the transit agency as an account-oriented system significantly reduces the per-transaction cost of maintaining a proprietary system. Additionally, a contactless, open payment system is, as Cole put it, “more future-proof” than the Metrocard in that the system is designed to change with the times. On the other hand, the Metrocard doesn’t involve and essentially runs on the same system with the same technology today in 2016 as it did in 1994. And the Cubic/TfL/Ventra system can still support time-based purchases (e.g., a 30-day card) or bulk purchase discounts as the current Metrocard can. As the world of fare payment technologies go, this licensing agreement gives London’s technology an edge globally, and New York City could be the first test case. If Cubic earns business, we’ll find out how this newish contactless system works in an agency adverse to technology change. It could be a real test and a potential game-changing in moving forward on a Metrocard replacement project that has been stuck in neutral for nearly a decade. The future history of the Metrocard has been, for nearly a decade, maddeningly out of reach. Since 2006, the MTA has discussed, tested and discussed again plans for a contactless next-generation replacement for the Metrocard, and a certain combination of technological uncertainty and organizational inertia, the effort won’t be fully realized before 2019 when the costs to maintain the current Metrocard system start to climb. But taps, and not swipes, are on the way. Now that the state has seemingly cleared the logjam that was the MTA’s 2015-2019 capital plan, the agency has started to take concrete steps to phase out the Metrocard. It began earlier this week with the release of a solicitation notice (pdf) in advance of an RFP that will be made available today. The MTA claims the RFP contains certain confidential information regarding the agency’s infrastructure, and it isn’t available to the public. But the agency has released enough detail either through the solicitation or in subsequent so that we have a general sense of what will go into the MTA’s tap-based contactless system. Adios, swipes. First and foremost, despite what you might have read elsewhere, the Metrocard isn’t getting phased out next year or even next presidential election. We’ll have plenty of time for presidential candidates to mock their inability to swipe. Although the MTA hopes to begin phasing in the next generation fare payment system by around June of 2018, much as tokens weren’t retired until nearly nine years after the introduction of the Metrocard, the Metrocard won’t be retired immediately. When last we checked in on this project, the MTA expected to phase out Metrocards by the end of 2023, but an MTA spokesman told me on Tuesday that this is not a definite timeline at this point. As part of the implementation, the MTA is going to maintain but rewire the current turnstiles. The RFP documents call for a supplier to install and maintain a TCP/IP ethernet-based communications network connecting fare collection equipment, including turnstiles, HEETs and payment vending machines. Still, the basis for the system is going to be contactless. The MTA will rely on bank cards, smart phones, or an MTA-issued card to process fares. This move will allow the MTA to lower the costs of fare collection and maintenance of a fare payment system. Only a small percentage of users will use the MTA’s own card, and the system — essentially next generation that doesn’t rely on a proprietary technology as, say, PATH’s SmartCard or London’s Oyster Card does — will be adaptable across MTA agencies. One interesting part of the solicitation document concerns the fare future. The MTA wants its next generation fare payment technology to respond to “alternate fare structures…including fare capping and/or changes to the fare incentive structures.” In other words, the MTA wants something that could be used for fixed fares, a zone-based fare structure or even a time of day-based variable fare. The possibilities with a system that could allow for tap in and tap out are more expansive than today’s swipe in-only system. While the MTA has no plans to start exploring a variable fare structure, I have been told that the agency wants the ability to do so in the future. So we get a few glimpses into the future and a bunch of uncertainty. The MTA’s initial contract for this new system will run for 69 months from the date of contract award, but the MTA doesn’t expect Metrocards to be phased out within six years from now. So there will be some period of overlap and some period of exploration as the MTA receives RFP responses. Yet, the overarching questions are whether and when the MTA can pull this off. The agency’s last true systemwide technological upgrade effort was the introduction of the Metrocard two decades ago, and now they’re going to try again with something that is essentially a new technology built on industry standards and evolving technology. We’ll see how this goes, but one thing is for certain: The Metrocard — and that message urging us to please swipe again — is on borrowed time. How much borrowed time remains to be seen. An update in the MTA Board materials shows how the MetroCard replacement has been delayed six months. When the Mayor and the Governor magnanimously set aside their unnecessary differences to come to an agreement on the MTA’s capital funding gap, it seemed as though a victimless dance had ended. The MTA had its money; the governor had his political victory over the mayor; and most New Yorkers wouldn’t notice any difference. But everything comes with a cost. For the MTA, the capital funding crisis could have been worse. Though we still don’t know exactly where the money will come from, by reaching an agreement in October, Andrew Cuomo and Bill de Blasio avoided a slowdown of work. Had the political bickering over the money stretched into December, the MTA’s authority to pay for ongoing capital work would have run dry, and the agency would have had to shutdown some projects. As it stands, the MTA had to curtail some impending work, and one of those victims was the MetroCard replacement effort. When last we visited this topic, the MTA had issued plans to institute a new fare payment system by the beginning of 2020 and phase out the MetroCards by the end of 2022. Now, though, thanks to Cuomo’s and de Blasio’s delays, the MTA had to hold back the RFP for the new fare payment system. Thus, the MetroCard replacement now won’t be ready for customer use until mid-2020, and the MTA expects to complete deployment of whatever the next gen fare payment technology will be until the middle of 2023. Six months may not sound like a lot, but it could potentially be a costly half a year for the MTA and its riders. It’s not clear how much this will cost the MTA, but there’s certainly a cost involved. When the MTA began the latest push to implement a new fare payment technology, they originally targeted late 2019 as the date for deployment date. After 2019, the cost to maintain the current MetroCard system will skyrocket, as the MTA’s original contracts expire. With what will be a 30-year-old technology still in use, the cost to keep everything up and running will be high, and a six-month delay adds to these expenses. One way or another, riders will be footing the bill, and all of that political bickering will have a real consequence long after Cuomo and de Blasio are no longer holding their respective offices. Don’t let anyone tell you these funding fights don’t matter. For the MTA, the problem is still one of execution. Ideally, in eight (!) years, the new fare payment system will be ready, but the MTA is still struggling with what this system will be and how it will be implemented. The agency wants to implement a system that relies on a contactless bankcard, smartphone or MTA-issued card, and it must include a new back-end system supporting payment and other financial functions along with a web-based interface for users to refill cards. Certain board members — such as Fernando Ferrar — have begun to question why the MTA is reinventing the wheel when contactless fare payment systems have become the norm throughout the world, but the agency is intent on finding that gem. If all goes according to the new plan, the MetroCard replacement contract will be awarded in January of 2017 with design, development, testing and installation set to last around 42 months. The MTA’s best laid plans gang aft agley, and they aren’t being helped by recalcitrant politicians using budgetary debates to further petty political disputes. But here we are, and another six months we must wait. That is a real, tangible consequence with real, tangible costs which all will fall on transit riders’ wallets come 2023. We start tonight, begrudgingly but admirably, with I Quant New York. Last year, this website made a huge deal about the amount of money you could put on a MetroCard for an even amount with the bonus. It was something blown completely out of proportion as the ability to refill a MetroCard essentially ad nauseam prevents monetary loss by anyone paying attention. Cards that expire with money left can be transferred to an active card by any station agent no matter how begrudgingly accepting they are of this aspect of their job. But the drum was beaten nearly to death, and in a victory for transparency, the MTA has added a new option to the MetroCard Vending Machine that allows you to buy a card that will leave $0.00 left over. Once the MTA started instituting bonuses of varying percentages at odd dollar amounts, the math became too complex to perform on a whim in front of a machine, but the agency — whether to capture dollars via unused fare media or otherwise — hadn’t introduced the concept of an even-amount purchase. 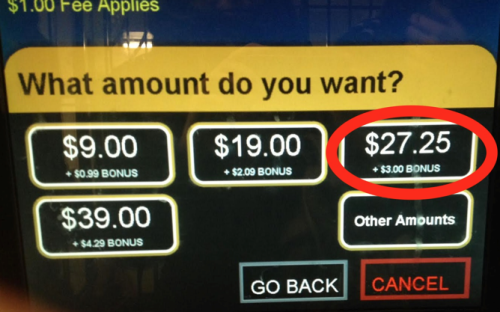 Now, you can spend $27.25, get a $3 bonus and have 11 rides (so long as you don’t use the AirTrain). Voila. It’s magic. I love my Unlimited MetroCard. I’ve been using one for years, and it makes using the subway essentially free. I pay once per month — in my case, on a pre-tax basis — and get a card that simply tells me to “Go.” I can swipe in at Grand Army Plaza and take a 2 or 3 to Franklin Ave. without thinking about the cost or a subsequent card purchase. I can hop on a bus without a thought, and in fact, the more I ride, the better a deal I get from my unlimited card. And it worked. 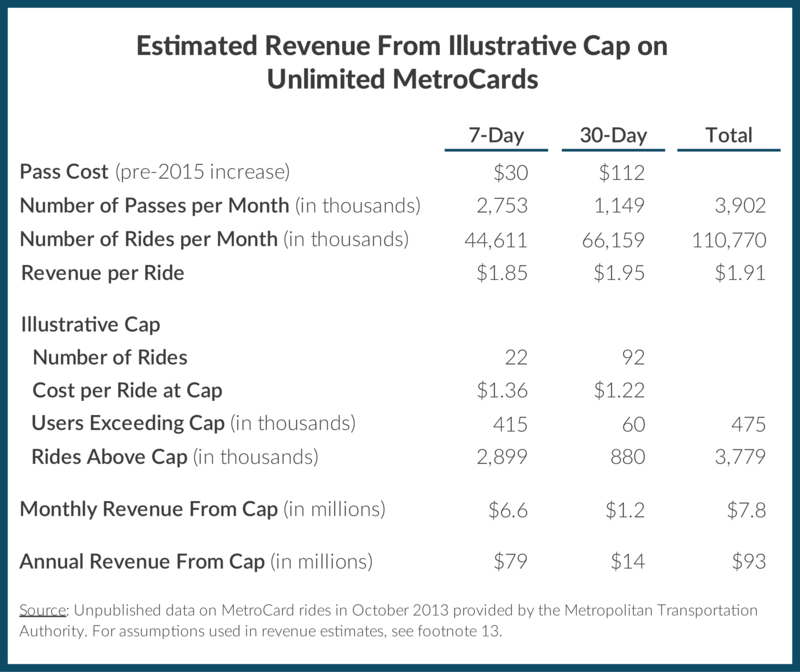 The average cost per ride a subway rider must pay declined precipitously, and only recently, through aggressive fare hikes, has the MTA clawed back revenue it lost to these unlimited cards. Still, the MTA drew in more in inflation-adjusted dollars in 1996 before unlimited ride cards were introduced than it does today. Furthermore, ridership has spiked — to over 6 million per day at times during peak ridership seasons last fall — and the MTA’s fare discounts push ridership. But has the unlimited ride card outlived its useful life? That’s the question New York City’s Citizens Budget Commission posed recently. The independent group argues that, with ridership up and demand greater than subway supply, the MTA could incrementally rollback the incentives from the unlimited ride cards. After all, in the 1990s, the agency had to incentivize riders to return to a restored system, but today, the system sells itself. By capping unlimited ride cards at levels beyond the reach of all but the power users, the MTA could, they argue, draw in an additional $93 million a year. The need for increased fare revenue need not be met exclusively through current practices of raising base fares and adjusting discounted prices. The MTA can generate revenue by capping the number of rides permitted on the 7-day and 30-day passes. Unlike recent fare increases hitting nearly every straphanger, the caps would provide needed revenue while affecting fewer riders, many who now enjoy very deep discounts, and would still retain heavily discounted fares. Based on data provided by the MTA for October 2013, riders used 7-day passes for 45 million rides per month and 30-day passes for 66 million rides per month. These rides can be attributed to an estimated 2.8 million 7-day passes and 1.1 million 30-day passes. At a price of $30 the break-even number of rides for a 7-day pass was 13; for a 30-day pass at $112 the number was 48 rides. (Both calculations use the $2.38 fare available with a volume discount.) Rides above these numbers are effectively “free” for the pass holder. Each “free” ride represented $2.38 in foregone revenue assuming the unlimited passes were eliminated and passengers purchased volume discount rides instead. The monthly number of “free” rides on the unlimited passes is estimated at 28.4 million. This equals about $67 million in foregone revenue monthly, or $807 million annually. Since a significant share of unlimited pass purchasers does not actually use the cards enough to reach the break-even point, these “unused” rides are extra revenue for the MTA. If this extra revenue was also foregone, the net gain from eliminating the unlimited passes would be $619 million annually. But eliminating unlimited passes would be a radical change, causing hardship for many straphangers and undermining the sense of convenient mobility the passes are intended to promote. A fairer strategy is to cap the number of rides on these passes at a number above the break-even point. The CBC acknowledges that the MTA hasn’t made enough information available to assess the proper cut-off for unlimited ride cards, but they assume a hair over three swipes per day, an exceedingly high volume of rides. Limiting pay-per-rides to 22 swipes per 7 days or 92 per 30 days could lead to eliminating nearly 4 million rides that are free — that is, they are taken after the breakeven point on MetroCards. The unlimited ride cards would still be a great deal, but the MTA would capitalize on very high volume users (and those who try to defraud the system by selling swipes) to the tune of $7.8 million a month. Part of me hates this idea. The psychological benefits of a true unlimited ride card encourage transit use at a time when New York City’s transit advocates should do all they can to keep residents out of private automobiles. It cuts against the grain of environmental advocacy, congestion pricing proponents and Vision Zero efforts to add any new psychological barrier, albeit a small one, to transit use. The MTA’s latest projections for the rollout of the fare-payment system that will replace the MetroCard. Now that the MTA Board committee materials officially recognize that the 7 line extension won’t open until at least the 2nd quarter of 2015 (something we knew last month), we can move onto another project that is oft- and again-delayed: the MetroCard replacement. According to the latest Capital Program Oversight Committee materials, the MTA’s next-gen fare payment system won’t be ready until 2020 if all goes according to plan. Systemwide rollout won’t wrap until 2022 under the current schedule. I’ve often said that the MTA’s latest technological advances are always five years away. Through the right circumstances, we finally get to enjoy countdown clocks on the A Division trains and BusTime through the city, but it seems that the MTA keeps promising B Division countdown clocks in “3-5 years” and has been for longer than 3-5 years. The MetroCard replacement meanwhile has been five years away from nigh on five years now. And the clock is ticking. With the current MetroCard technology, now well over 20 years, the MTA faces a sunset date. After or around 2019, the cost of maintain the current MetroCard infrastructure will spike as maintenance contracts expire and parts grow harder to find. Thus, there has been some urgency surrounding the 2019 deadline for the introduction of a new fare payment technology. Various stops and starts, driven, in part, by rapid turnover atop the MTA, have delayed the project, but as Michael DeVitto discussed at my Problem Solvers session last March, the MTA is on track to do, well, something within a few years. Now, however, the timeline is slipping. According to the latest Board documents, the MTA is gearing up to pass a major milestone in its efforts to find a replacement for the MetroCard that can serve for the next few decades. The new solution has to be integrated and adaptable with a contact-less payment system and a new backend for payment processing. By the end of next month, the MTA expects to wrap the business requirements development contract and will issue an RFP in late winter. The MTA expects to award a contract in mid-2016, and a deployment timeline takes shape from there. According to the MTA docs, system design will run for 13 months and back-end development for two years. Contactless readers will then be installed in buses and subways over the following 21 months before vending machines are outfitted throughout the system. Much like the MetroCard’s initial rollout, the MTA expects to bring the entire system online within three calendar years at a cost of $450 million. But we know how reliable those cost estimates have been in the past. These are positive concrete steps, but the problem is that Transit has to keep the current MetroCard system up and running until system-wide rollout is complete. In essence, the agency has to run and maintain two systems — one three decades old and one brand new — at the same time, and since the new system is now scheduled to be online after 2019, the MTA’s costs are going to jump. In fact, an Indepdent Engineering Consultant notes that the budget “may not be adequate” when considering the costs of maintain the MetroCard system in a state of good repair beyond 2019 and through 2023. So where exactly does this leave us? The MTA is still five years away from a replacement for the MetroCard, and it seems nearly definite that they’ll miss their own 2019 deadline by a considerable margin even if all goes according to plan. This is unfortunately a common theme with technological upgrades and a challenge the MTA faces in convincing politicians it deserves $32 billion to improve the system. They need to deliver something at some point, but five years away is a frustratingly shifting target that seems to remain perennially five years away. 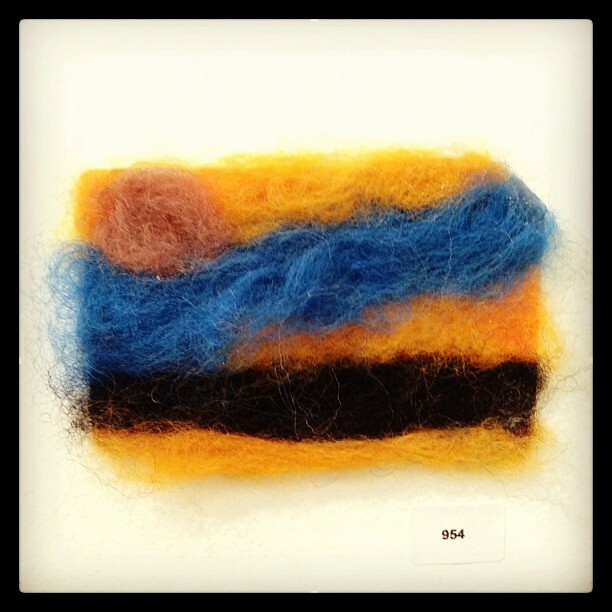 When I first launched the “Problem Solvers” series with the Transit Museum, I knew that I wanted to focus a session on the future of the MetroCard. For a few years, I’ve tried to schedule a sit-down with the right someone at the MTA to discuss the agency’s next-generation fare payment plans and the prognosis for the familiar piece of plastic New Yorkers carry with themselves 24-7. At first, I couldn’t get anyone because the MTA didn’t really know what it was going to do replace the MetroCard; it knew only that by 2019 it would be too expensive to maintain the current system. But now I have some exciting news: The next “Problem Solvers” Q-and-A session, set for March 19, will focus on the MetroCard’s future. Joining me at 6:30 p.m. at the Transit Museum in Brooklyn will be Michael DeVitto, Vice President and Program Executive for fare payment programs at NYC Transit. We will discuss the future of the MetroCard, current initiatives on new fare technology, and all that goes into designing a fare system for the city’s transit network. We will, of course, talk about progress toward a new fare payment system. “Problem Solvers” is a free event hosted by the Transit Museum, and this session is slated for Wednesday, March 19th at 6:30 p.m. (with doors at 6). Please RSVP here and join me for what should be an illuminating and informative conversation on a topic I’ve followed closely over the past seven and a half years. I’ve been sitting on a bunch of open tabs for a little while and thought it would be a good idea to get around to sharing these. These are stories I found interesting or newsworthy but just haven’t had an opportunity to post here. I’ve talked a bit about the MTA’s new green fee and the money realized from unused MetroCards, and a recent piece in The Times put those dollars into context. Throughout the first decade of the 21st century, the MTA collected half a billion dollars from unused fares. Since straphangers have to pre-pay for MetroCards, dollars that are left on the cards long after their expiration dates remain with the MTA, and on an annual basis, the money is a small, but important, part of the agency’s annual budget. Unused fares isn’t something that’s come about because of the MetroCard era. Back in the day, New Yorkers would buy tokens and never use them. They would get lost, get forgotten, get overlooked, and the MTA could collect those fares. But today with uneven bonuses that make the math of a free fare more difficult, more dollars are left on cards that expire, and the $1 fee for new MetroCards means revenue as well. As the MTA phases out the MetroCard — the topic of my March 19 Problem Solvers session — these unused fares may diminish a bit. The next system may well be a pay-as-you-go set-up that doesn’t focus around any proprietary fare collection system. While the MTA will lose the money from unused fares, it will also drastically reduce the amount it has to spend to collect fares. That’s a win for the customers, and a win for the transit agency as well. As New York City subways go, the 3 train runs an odd route. It stretches deep into Brooklyn but then stops short of anything in Manhattan. It terminates at 148th St. near the Lenox Yard and goes no further north. In a piece at Welcome2TheBronx, Richard Garey argues for extending the train to the Bronx. With the need for some cross-Bronx subway service and the incoming soccer facility near Yankee Stadium, the time may be right to look at some subway extension options. Garey’s post focuses on the 3 train as a way to serve neighborhoods that once enjoyed streetcar service and now don’t, but I think he has the routing wrong. The 3 shouldn’t end up as another north-south route in the Bronx but could instead cut across the borough, serving areas that don’t have good cross-Bronx transit options while boosting subway service. It is, after all, a fast ride downtown on the IRT express. Without a massive infusion of cash, we’re just dreaming, but it’s an intriguing proposition after all. For years, I’ve been using the 149th Street-Grand Concourse subway stop as a transfer point on the way to Yankee Stadium, and for years, it has been one disgusting station. The walls were marred by leaking pipes, and on the way home from a World Series game in 2001, my sister and I saw squirrel-sized rats on the uptown 2/5 platform. It was very, very unpleasant. Recently, the station underwent a renovation, but a few area residents are unhappy. One transit buff took a video tour of the station post-renovation and discovered some subpar work. Meanwhile, another group of residents wants to restore elevator service that was shuttered 40 years ago. As best as I can tell, the elevator in question went from the 2/5 platform to street level. The MTA has no money, and protestors hope Mayor de Blasio can help out. I wouldn’t hold me breath. Thanks to an infusion of funds from Council member Vincent Ignizio, four stations along the Staten Island Railway — Great Kills, Eltingville, Annadale and Huguenot — now have countdown clocks. The work is part of a $675,000 initiative funded by Ignizio’s office that will eventually include a Subway Time component that will add these SIR stations to the MTA’s tracking app. For now, the information is available on the St. George-bound side, but Tottenville-bound service will have its time in the sun as well. If you pay for it, it will come. Twenty years ago, Rudy Giuliani was our mayor, Bill Clinton the president and Mike Gallego the Yankees’ starting short stop. Twenty years ago also marked the day the MetroCard made its New York City debut. 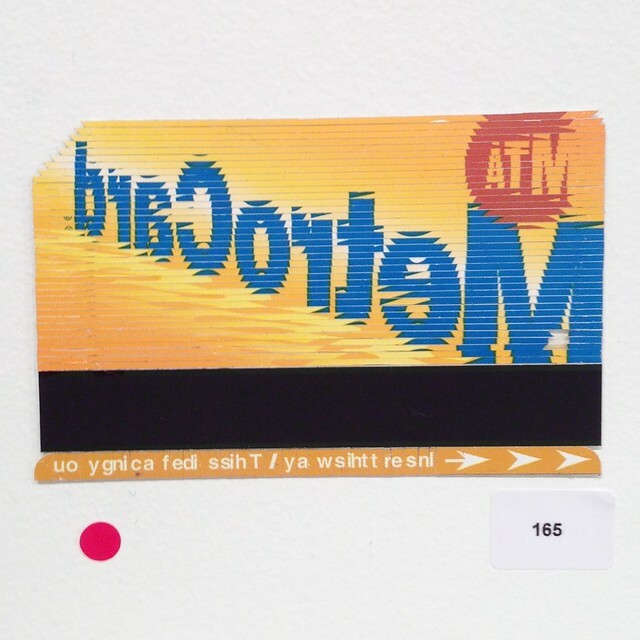 On January 6, 1994, at two stations in Lower Manhattan, the MetroCard made its debut as riders at the IRT’s City Hall stop and the BMT’s Whitehall St. station could swipe in with the blue-and-yellow pieces of plastic. Three years later, in 1997, every station was equipped with MetroCard-ready turnstiles, and the MTA could begin offering unlimited ride cards thus realizing Stangl’s words. Those unlimited fare cards revolutionized transit and lead to a massive increase in ridership. The costs are higher today, but the bulk discount options remain a good deal for daily riders. Over the years, the MetroCard has had its ups, downs and “please swipe again at this turnstile” moments. It took nearly 19 years for display screens to show the expiration dates for unlimited cards, and lately, both the fronts and backs of the cards have been for sale. I’ve always loved my unlimited MetroCard though through thick and thin. Today, we’ll tip our caps to that ubiquitous piece of plastic. Please, swipe again.